Our new 6216 and 6224 laser printers provide stunning image quality, high speed printing and remarkable performance at a great price. Add superior reliability to our outstanding support and midrange systems expertise and you have an incredible price performance printing solution. Remarkable Performance in Laser Printing At 1,200 dots per inch, these printers offer print quality rivaling the output of typesetting equipment that costs significantly more. Paper Handling Features to Suit Your Needs 6216 and 6224 printers provide an outstanding price performance solution for printing needs that include high quality text, detailed graphics, photos or images on a variety of paper stock including letterhead, labels, transparencies, envelopes and cards. A World of Compatibility and Support Our 62xx printers offer guaranteed IBM compatibility. Moreover, their ability to support twinax, coax or Open Systems can make 62xx performance available across your enterprise while providing investment protection should your system environment change. Powerful printer management tools allow status and diagnosis, remote setup, toner and paper alerts, job statistics, and print inventory all viewed with a graphical user interface either locally or through a network. 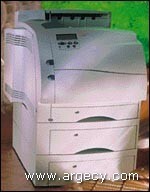 * If 2,000 sheet input is selected, only 1 of either the 250 or 500 sheet can be used.